Hotel Novotel Berlin am Tiergarten. Book now! Fitness room! 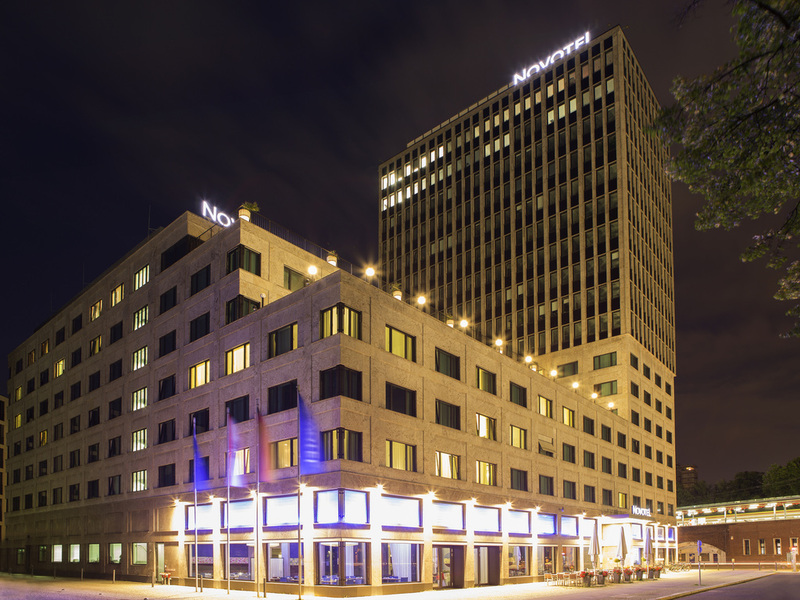 In the modern rooms of the 4-star Novotel Berlin Am Tiergarten hotel, families, business travelers and tourists alike will all feel right at home. Free WIFI and a desk space in the rooms make preparing for conferences remarkably easy. Eleven meeting rooms are available for up to 350 people. The central location of the hotel is ideal for exploring the capital. End your evening in our bar or restaurant or take some time out to relax in our fitness and spa area. Simple and straightforward, casual and relaxed: This is Novo2, an innovative lounge, bar and eatery, enhanced further by its modern culinary concept. DISCOVER A PLACE WHERE LIFE TASTES BETTER! The restaurant at Novotel Berlin Am Tiergarten has its own bar and seats up to to 85 people. The bar is air-conditioned and is open daily from 8am to 1am, giving you ample time to enjoy a cold drink or light snack in the setting of a contemporary bar. The room was larger than expected, clean and well looked after. The reception and cleaning staff were friendly and efficient. The bar staff were lovely but maybe a bit overwhelmed by the number of clients. stayed here before so knew what to expect. only stayed one night but bed was comfy.. only thing to note was, i had tea and coffee but no milk or sugar, so couldnt use the faciltites. We booked this location due to our previous booking at Novotel Berlin Mitte being cancelled shortly after 18:00. Although written in the booking, i never experienced this without any prior warning. The bad: 1. We were charged for Late Checkout 2. We were told breakfast was included at check in and later the next day we had to pay 42 euros. 3. Never recieved welcome drink as Silver member 4. We asked for help with a taxi and was told just wait outside for one (4 star hotel service?) Good: 1. The late checkout fee was taken off but not after talking to 3 people 2. Room was clean and quiet with a great view After this experience and recent previous, i will no longer continue with Accors hotels after my 7-8 year tenure. The quality has simply decreased with finding better value and service at other hotel chains. comfortable room, excellent breakfast, convenient place for traffic. except not many convenient stores nearby. The stay in your hotel is always very pleasant. The staff is always very friendly. The rooms are always very clean. The atmosphere is always very pleasant. perfect place to stay for our family trip to Berlin, central, directly close to S-Bahn station and in walking distance to restaurants. Overall, I would have given the hotel a 9/10. The only reason I gave it a 8 are due to the fact that the hotel policy does not allow for an iron and ironing board to be delivered to a room. Quick check-in, nice staff and helpful. Good rooms. feedback: I notice that you only get 1 bottle of water per stay instead of per day in most other hotels. Would be nice if you would do this too. Everithing was great thank you. The location to public transit was fantastic! Staff was friendly! A couple negatives, the room was super hot! We weren’t able to turn the air/fan on or the heat off. A second negative is there was construction directly across the street. Isually not a bog deal, except woth the warm temperature of the room we had to leave the windows open...construction began as early as 0630! Nice Hotel, nice location, all perfect. All was fine and we enjoyed very much. Staff was very welcoming, breakfast with huge choice and options. Bed (mattress) was excellent, all contribute that we had a wonderful weekend. I booked a room for a two day stay with Novotel from 12-14 March with free cancellation until 6pm on the day of each stay. On the afternoon of Tues 12 March my flight from London City was cancelled only 2 hours before take-off, leaving me little time to cancel my room for the night, but I was able to call at 5:05pm UK time to do so. However, the terms of the booking were that I could cancel until 6pm CET. Needless to say, I asked Hotels.com to explain to Novotel reservations the reason for my cancellation and whether they could exercise discretion to cancel without charge given the circumstances beyond my control and the fact that I was only minutes over the deadline. It took the best part of a week of chasing Hotels.com, who told me that they had tried a number of times to speak to the Novotel reservations team but without success. When they finally did so, I simply had the standard response that I was outside the terms of my cancellation and therefore a refund would bot be approved. The reason given -- that they were unable to sell the room to another guest -- is unacceptable and misses the point. Had I called 6 minutes earlier there would have been no problem and I would have had a full refund. That I stayed for the second day did not seem to factor into Novotel's considerations, nor that Novotel has missed out on the repeat business that they would have received from me because I am returning to Berlin next week for further business meetings. Not only has Novotel lost a customer, the colleague who I am flying with will not be staying at the Novotel either, and I have discouraged my entire department from using Novotel in the future. As a businessman, I expect the same high standards of discretion and understanding about circumstances outside my control as I would show to my clients in similar circumstances. Novotel has demonstrated that it does not share my values and therefore I won't trouble Novotel with my business in the future. I am happy for this feedback to be shared directly with the reservations desk at Novotel Berlin, although I appreciate they are unlikely to be available to read it, let alone care. Stayed for a 2 week business trip to Berlin. 1. Would wish for a breakfast included room or an option to sign up at the point of checkin. May have missed the option of breakfast-included during booking and would be nice to be given that option at check-in. 2. Wished there was 1 more treadmill in the gym but overall the gym was great 3. Overall a great stay. Room was clean and hotel well maintained. Check-in was not satisfied. The staff couldn't find my reservation though I informed my surname and number of nights that I booked. He also forgot to give me drink voucher for Accor silver card holder.